You are invited to celebrate World IP day with us on Thursday April 26th from 4-6 pm at our IP Open House in the Library’s Collaboratory in the SLC. Established by the World Intellectual Property Organization (WIPO), World Intellectual Property Day occurs every April 26th to recognize the role that intellectual property rights (patents, trademarks, industrial designs, copyright) play in encouraging innovation and creativity. Please join us at an open house from 4pm – 6pm to learn about what supports are available at Ryerson to move your ideas from the lab to the market place. Drop by for a cookie and to talk to OPVRI and Library staff and external IP experts who can answer your questions about patents, trademarks, and copyrights. You can also explore the Ryerson Library Collaboratory, a just launched is a space and initiative in the 3rd floor of the Library that provides faculty and their research teams with space and technology resources to facilitate research and course development. This year WIPO is celebrating women and IP, see Powering Change: Women in Innovation and Creativity on the WIPO site. In February, Ryerson was excited to host Rajiv Jhangiani, a faculty member from Kwantlen Polytechnic University, for a talk on his research into the use of open textbooks to teach psychology. Open textbooks are defined as textbooks to which the copyright holder has assigned an open license, which allows anyone the right to access, reformat, and customize the textbook to best meet their needs. These textbooks can be downloaded or printed in hard copy for a small cost via print-on-demand. The author, rather than a publishing company, retains the copyright, and the textbooks are often peer reviewed. As an example of an open textbook, Dr. Jhangiani’s Research Methods in Psychology is in its 2nd Canadian edition. It can be downloaded for free in a multitude of formats, from PDF to epub, and it can be printed on demand for a small fee – $10.90 for black and white, or $32.25 for a colour version. As a comparison, a textbook on the same topic from a major publishing company is currently retailing on Amazon.ca for $276. Though the importance of this cost difference to students cannot be understated, perhaps an even greater benefit of open textbooks was brought up by Dr. Jhangiani at his talk – by publishing with an open license, Dr. Jhangiani felt he had much more latitude to provide unique Canadian examples that he thought would be most beneficial to his students, without the pressure from a publishing company to try to address larger markets. Because the textbook is published with an open license, any educator can take the textbook, use the chapters that they like best, and replace Dr. Jhangiani’s examples and case studies with the material that is most relevant to their course. This flexibility is the strength of the open textbook model! If you are interested in adopting an open textbook in your course, check out the offerings available at BC Campus, Open Stax College from Rice University, and the Open Textbook Library from the University of Minnesota. If you have questions about adopting an open textbook or you have thoughts on how you might like to use them in your course, contact us at the LTO, michelle.schwartz@ryerson.ca, ext. 2094. 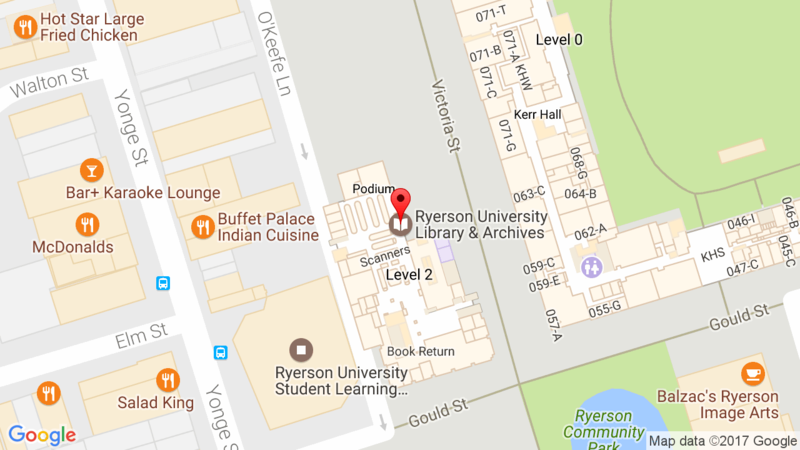 The Ryerson Library and Archives can also assist in finding open access educational resources to use in your teaching – please contact your Subject Librarian , call Ann Ludbrook at ext. 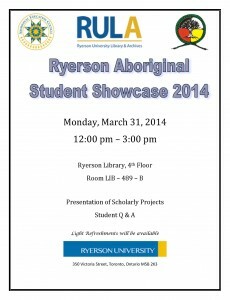 6910 aludbrook@ryerson.ca or have a look at the Ryerson Library Open Access Educational Resources Guide. Do you want to learn how to knit? From librarians? Of course you do! 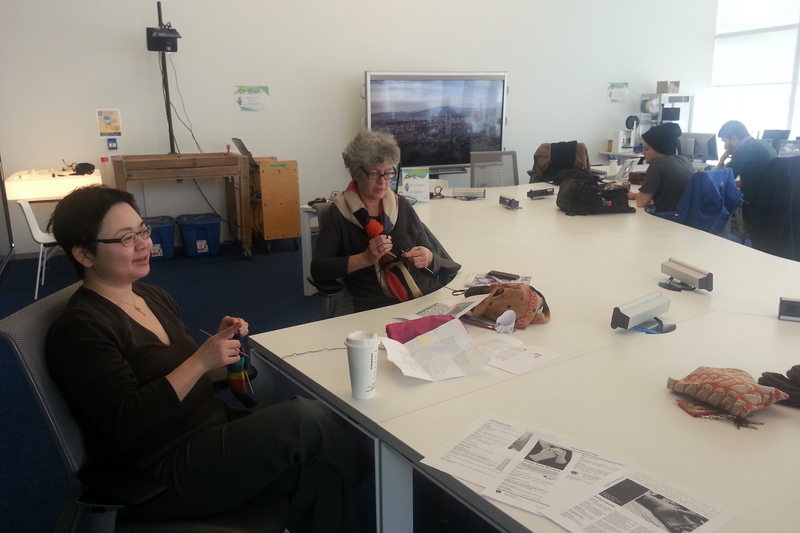 May (left) and Sally (right), talking about their knitting fails…it even happens to the pros! On Mondays at 11 a.m., join Trina Grover, Collection Services Librarian, May Yan, ER Discovery & Access Librarian and Sally Wilson, Web Services Librarian, in the Library’s Digital Media Experience (DME) lab on the 3rd floor of the Student Learning Centre (SLC). No registration needed, just drop in to work on your knit projects with fellow knitters, or learn some knitting basics from these crafty ladies. Everyone is welcome, regardless of their skill level. Even if you’re an experienced knitter looking for a knitting community on campus or just somewhere to work, feel free to join the group. The knitting skills learned at this drop-in will help students progress to future workshops planned around knit-wearable projects and computational fabrics / wearable computing, which may be of interest to those with knitting experience. The Library’s Digital Media Experience (DME) Lab is a new space on the 3rd floor of the Student Learning Centre (SLC) designed to help all Ryerson students learn basic and advanced digital skill-sets, while exposing them to new and emerging technologies. On April 15th, Ryerson Library hosted the annual Student Staff Appreciation Party. 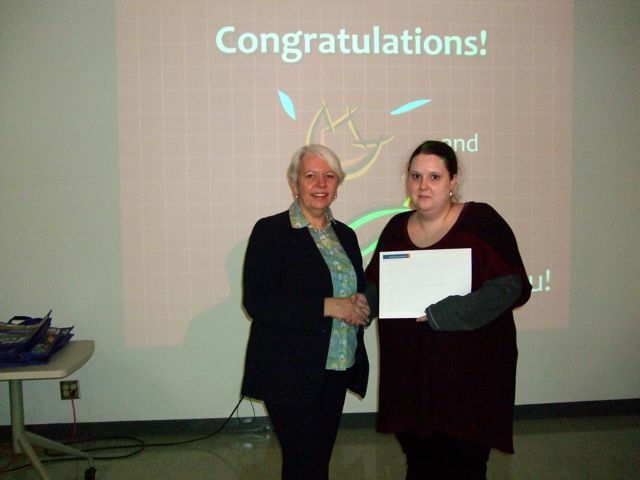 This celebration honours the Student Employee of the Year Award recipients. The Student Employee of the Year Award recognises students who have achieved excellence in their work environment, and the winners receive an award as well as a cash gift. The selection committee had a difficult time selecting just one recipient this year, and ultimately recognized two Ryerson students: Romana Naz and Sarah Hubbard pictured below with RULA’s chief librarian, Madeleine Lefebvre. This event also recognized graduating student employees including Hanny Sierra, who is the first recipient of the Emerging Professional Award offered by the Career Centre, and the first Experiential Learning Work Study Program Award. 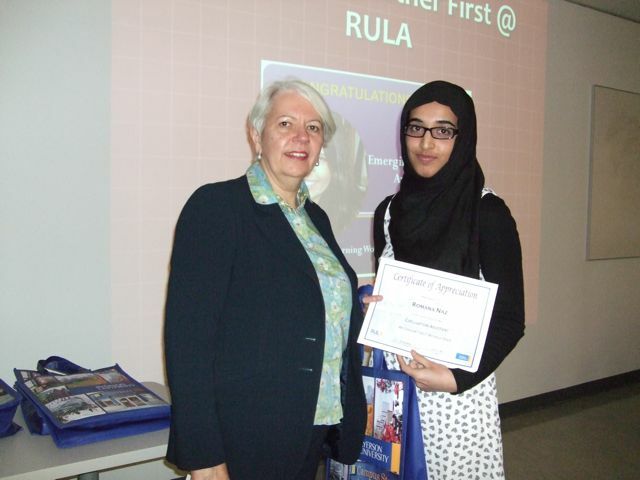 Congratulations to the award recipients, and we wish you the best of luck in the future! Romana Naz & Sarah Hubbard pictured with chief librarian, Madeleine Lefebvre. One-Stop Course Readings Team Wins Blue & Gold! Congratulations to the One-Stop Course Readings Service Team for winning the President’s Blue and Gold Award of Excellence! The One-Stop Course Readings Service makes high-demand course readings available to students over the duration of their courses. This award recognizes the efforts of ten librarians and technicians in addition to several library assistants and four work study students at Ryerson Library who collaborate to provide faculty and students with convenient and copyright compliant access to scholarly articles for their course readings. This service team works alongside the Bookstore, with support from Digital Media Projects, Computing and Communications Services, and the Chang School to provide a service unique to Ryerson Library: one that exemplifies Ryerson’s values of collaboration, innovation, and integrity. Congratulations to all the members of the One-Stop Course Readings Service Team for winning Blue & Gold! The 5th Annual Aboriginal Student Showcase is scheduled for Monday March 31st, and all are welcome to attend. This year’s agenda includes presentations by students across four faculties, Ryerson library and faculty speakers, and representatives from the Aboriginal Education Council. Light refreshments will be served. 12:00 pm- 12:30 pm – Opening remarks by Madeleine Lefebvre, Chief Librarian; Dr. Cyndy Baskin, Chair – Aboriginal Education Council; Dr. Denise O’Neil Green – Assistant Vice President/Vice Provost – Equity, Diversity & Inclusion; and Joanne Dallaire, Elder – Aboriginal Education Council. 12:30 pm-1:00 pm – 1st presentation by Jeff Swartzentruber, Mechanical Engineering – presenting on his research and mentorship with Dr. Peter Lui of the OMAX Corp. in Seattle, Washington. 1:00 pm-1:30 pm – 2nd presentation by Nicole Wemigwans & Kathleen Longboat- presenting on their experiences attending the Child & Youth Care World Conference in St. Johns, Newfoundland. 1:30 pm-2:00 pm – 3rd presentation by Brittany Ryan -RULA’s very own student assistant, presenting on her mentorship with acclaimed actor, director, and choreographer, Michael Greyeyes. 2:00 pm – 2:30pm – 4th presentation by Caitlin Davey, Doctoral student of Clinical Psychology – presenting her project work entitled: Development, Implementation and Evaluation of a Knowledge Translation Strategy to Enhance Mental Health and Wellbeing Among Aboriginal Students.